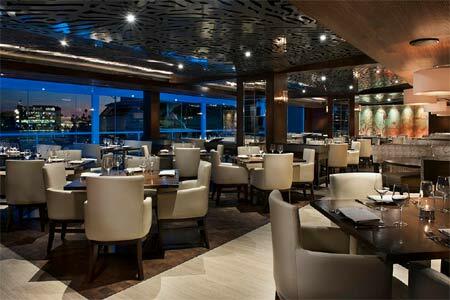 High-end waterfront dining experience buoyed by an eclectic mix of sea-inspired dishes. : This isn't your father's iteration of The Ritz. Located on the water along Newport Beach's Mariners Mile, the new version of the venue is radically different from its longstanding Fashion Island-adjacent locale. Dark woods, large windows, and a sleek white and blue color scheme help draw a nautical vibe into the space in a modernly elegant manner. The ambience is furthered by the abundance of seafood offerings. Start your meal with a caviar-topped organic egg mixed with smoked salmon, or you can go raw with a sushi roll or a simply prepared hamachi crudo served on a slab of Himalayan salt. While you won’t see too many old-school standards on the main menu, you will find nicely executed surf ‘n’ turf items, such as the bone-in filet mignon with foie gras butter or the rich cioppino with a bounty of lobster, scallops, mussels and other seafaring delights. A generous slice of coconut cake is plenty of dessert for a group to share. The compact list of by-the-glass wines is balanced by the selection of sakés and skillfully assembled craft cocktails. On weekends, your day can start with a plated brunch highlighted by the restaurant’s classic lobster Benedict.